He was seen to be anointed with honey and stung by bees. Contesting there he received a crown. 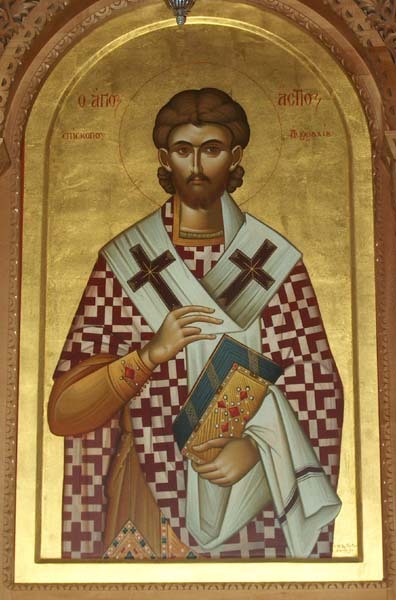 Hieromartyr Asteios was born an Illyrian, and was bishop of the city of Dyrrachium (Durres in modern Albania), during the time of Emperor Trajan (98–117). The Saint once had a dream, a foreboding of his impending suffering and death for Christ. He was arrested by the Roman governor of Dyrrachium, Agricola, around the year 98. He was beaten with leaden rods and ox hide whips, but Asteios did not renounce Christ. They then smeared his body with honey, so as to increase his suffering with the stings of bees and flies, and crucified him on a piece of wood near the city walls on a hot summer day for refusing to worship Dionysus. In this way he received the unfading crown of martyrdom. 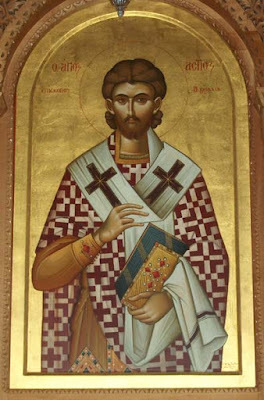 Saint Asteios is commemorated on July 6. During this period, many Christians fled to Albania to escape persecution in Italy. Among them were seven holy martyrs: Peregrinus, Lucian, Pompeius, Hesychius, Papius, Saturninus and Germanus. Witnessing the martyrdom of Bishop Asteios, who was crucified by the Romans and smeared with honey so as to be stung by bees and flies, they openly praised the courage and firmness of the Holy Martyr. Because of this, they were seized, and having confessed their faith in Christ, they were arrested, chained, and subsequently drowned in the Adriatic Sea. Their bodies, carried to shore by the waves, were hidden in the sand by Christians. The Holy Martyrs appeared to the Bishop of Alexandria ninety years later, ordering him to bury their bodies and to build a church over them. Their feast day is July 7. 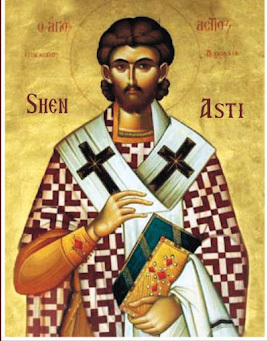 Saint Asteios is the patron of the city of Durres.